Where are bananas reportedly produced with trafficking and/or child labor? According to the U.S. Department of State 2017 Trafficking in Persons Report, bananas are listed as being produced with forced labor in Ecuador. According to the U.S. Department of Labor 2016 List of Goods Produced by Child Labor or Forced Labor, bananas are reportedly produced with child labor in Belize, Ecuador, Nicaragua, and the Philippines. According to the 2017 Trafficking in Persons Report, Belize has a Tier 3 ranking, Nicaragua has a Tier 2 Watch List ranking, Ecuador has a Tier 2 country ranking, and the Philippines has a Tier 1 ranking. What does trafficking and/or child labor look like in the production of bananas? On banana plantations, child labor often occurs when children accompany their parents to the plantations to assist their parents or to supplement family income. This is especially common in areas where prices for bananas are extremely low. Children of poor, indigenous, or otherwise vulnerable or marginalized families may be at heightened risk. Banana production is pesticide intensive because of the mono-culture nature of production. One such pesticide that is used in banana production is chlorpyrifos. The use of this pesticide poses a risk to children as it is a neurotoxin. Chlorpyrifos can cause nausea, lung congestion, chest pain, dizziness, respiratory paralysis and death. Children are especially sensitive to chlorpyrifos toxicity. Benomyl and chloropropane are two other pesticides used in commercial banana fields, both of which have been found to be carcinogenic and linked to birth defects. In addition to pesticide exposure, other labor concerns include wage and overtime violations, discrimination against pregnant workers, dangerous working conditions and sub-par safety precautions, and anti-union sentiment. Among adult and child workers interviewed in plantation towns in the Philippines, 22.5 percent of households reportedly have a child working, according to a 2015 study. This study also indicated that 76 percent of child laborers no longer attended school. On banana plantations, child laborers are assigned to bagging and stripping off banana leaves or peeling bananas that are unfit to sell and end up in dry animal feed. A 2013 Oxfam New Zealand study consisting of interviews on banana plantations noted that most child laborers worked eight to 12 hours a day. Children working on plantations were often unaccompanied and lived in makeshift tents. Violence and harassment toward union representatives on banana plantations remains an issue. Oxfam reported that in the Philippines, workers attempting to unionize faced harassment, including physical violence. In Guatemala, seven members of the Union of Agoindustrial and Related Workers (STAS) were murdered between 2011-2012. Labor activists working in agriculture in Honduras have also received regular threats. Bananas are grown from a bulb or rhizome. Over the course of nine to 12 months the plant develops into a tall herb. Bananas can typically only be harvested in equatorial regions. Once grown, banana bunches are very heavy and require more than one person to cut them down and carry them. A large number of manual laborers are required for harvesting. Laborers will usually work for a middleman who deploys them to various plantations or farms, either small-medium scale or corporate growers who then sell to major global brands such as Dole, Chiquita, or Del Monte. 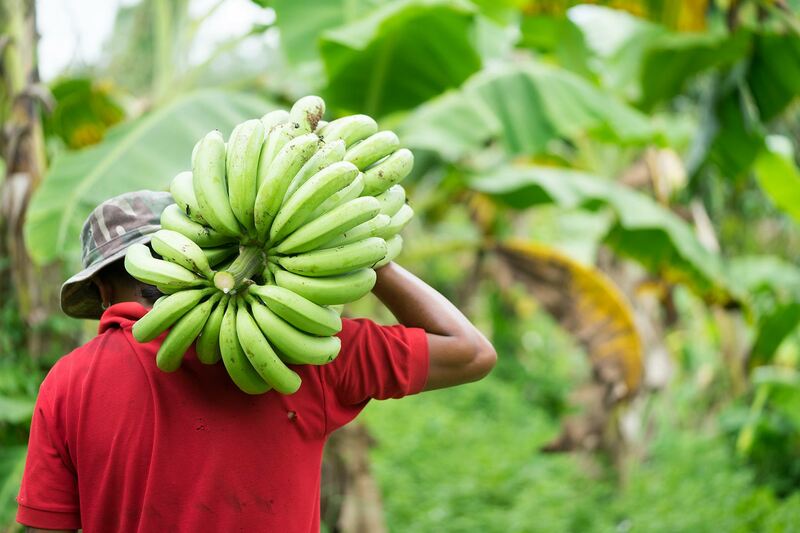 The majority of expenses in banana production go to packaging, fertilization, and pesticides for the product itself (Fairtrade International). Most bananas are consumed in the country of production, so only 15 percent of bananas produced worldwide are exported. How do Trafficking and/or Child Labor in Bananas Production Affect Me? Bananas are one of the top five fruits consumed worldwide. Bananas are used in baby food and as flavoring in food products, such as yogurt; they are consumed as banana flour and powder, banana juice, and banana alcohol. According to the U.S. Department of Agriculture (USDA), each American eats an average of over 11 pounds of bananas each year. Over 95 percent of the 4,951,497 tons of bananas that the U.S. imported in 2016 were grown in Latin American nations. In 2016, the top five countries exporting bananas to the United States were Guatemala, Ecuador, Costa Rica, Honduras, and Colombia. Four companies, Dole, Chiquita, Del Monte, and Bonita control over 80 percent of the banana market in the U.S. In Belize, public education that is free and mandatory has been implemented in conjunction with a cash transfer program to encourage children to attend school. Since the 2002 release of a Human Rights Watch (HRW) report exposing child labor on Ecuadorian banana plantations, the government has made significant efforts to remedy the issue. New regulations raised the minimum age of employment to 15, banned children from dangerous work, and imposed higher fines on employers caught employing children. The number of children employed illegally decreased from 800,000 in 2002 to 600,000 in 2009, and 115,930 in 2016. Dole Europe recently committed to ensuring that its banana supply chains are fully sustainable by 2020, signing on to SIVAF, a European initiative aimed at improving companies’ environmental and social track records and by strengthening their knowledge, capacity, and communication with suppliers and farmers. Read HRW’s report on child labor in Ecuador. Read about labor violations in supply chains in the Philippines and Latin America.